KCCM (member of the LAPS knowledge network of the Gerrit Rietveld Academie) explores the ways public spaces and landscapes are made by, used by, lived in, transformed and shaped by people. ‘Sensing Nature (1972-2022)’ focuses on the history of the Amstelpark that was established for the horticulture exhibition, the Floriade 1972. In the Orangerie the fieldwork and archival research that forms the bases for several spatial reconstructions in the park will be exhibited. 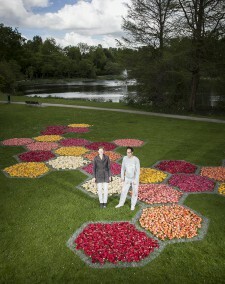 In workshops, debates and events a renewed relation to the cultivated urban nature will be developed in the Amstelpark with an eye to the upcoming Floriade in 2022. This exhibition is part of the summer program of Zone2Source in the Amstelpark in Amsterdam. In one of the small original Floriade pavilions, designed by Oyevaar Stolle Van Gooi Architects, a new species of lily was baptised ‘Princess Gracia’ by the princess of Monaco on September 14, 1972. The cultivar was bred by the firm De Jong Lelies in Andijk. During a flower arranging demonstration with lilies in the same pavilion we will review the status of the lily at present. The flower arrangements that are created during the demonstration will play a role in the Midsummer Nights Dream Solstice Performances Event. Portraying (owners with) dogs is a habit during this yearly event in the Amstelpark. The reconstruction of the VU Hortus contribution to the Floriade 1972 in the Orangerie will be used as a backdrop for dog portraits. Presentation and debate about the meaning and role of Floriades in the past, present and future moderated by Jeroen Boomgaard (LAPS). Only a fragment of the original Rosarium is visible today. In the layout of the Floriade 1972, a vast pattern of diagonally positioned rectangles was spread over the area between the restaurant and the Orangerie. This pattern will be reconstructed with chalk lines that will be coloured by tuned cars in rose tints. Among the pavilions that were built for the Floriade 1972, one pavilion is missing. It turns out that it was buried in the eighties to improve the security in the park. This activity is an attempt to excavate the French Pavilion with the help of amateur archaeologists and other enthusiasts and to think of future scenarios for this pavilion.